You see that picture up there? That's all who should be judging American Idol as long as it keeps going. But...no more. It's been confirmed by Paula herself. After eight seasons, Paula Abdul's time on American Idol is finished. "With sadness in my heart, I've decided not to return to Idol," Paula Twittered. "I'll miss nurturing all the new talent, but most of all being a part of a show that I helped from day one become an international phenomenon." "What I want to say most, is how much I appreciate the undying support and enormous love that you have showered upon me," she added. "I do, without any doubt, have the BEST fans in the entire world and I love you all." In a statement Tuesday, a Fox TV rep said: "Paula Abdul has been an important part of the American Idol family over the last eight seasons and we are saddened that she has decided not to return to the show. While Paula will not be continuing with us, she's a tremendous talent and we wish her the best." 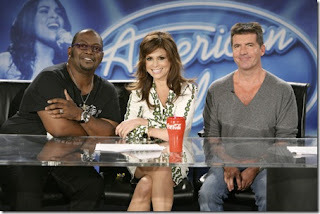 And then there were three--Simon Cowell, the judge who is the most honest and yet people hate him so, Randy Jackson, the cool judge that you just have to shake your head at sometimes for his judging, and Kara DioGuardi, the judge whose purpose I'm still confused about. But I can tell you this: there may be a significant drop in viewers this season. I mean, personally, I sort of fell off from American Idol after Fantasia's season. I watch the auditions, but after that, I fall off, no matter how hard I try to watch the rest of the season. I don't know. I feel like the show needed to bow out gracefully while it was still on top, you know? But no. People can never do that for the sake of money, which is kind of understandable, but I would rather have been working on a show that went out gracefully after maybe 5 or 6 seasons (because I was really done after Jordin Sparks' season) than a show that just kept going on and on on.....It's too much to me. But yeah, like I was saying before I went into this mini tirade LOL, there may be a significant drop in viewers this season. I mean, since the show is continuing on, the THREE ORIGINAL JUDGES SHOULD BE THERE!!!! EMPHASIS ON THREE AND EMPHASIS ON ORIGINAL!!!! Paula's gone, man. How in the world are you going to have American Idol WITHOUT PAULA ABDUL?! It just won't feel right. I mean, people are already saying that they won't be watching. I think FOX might have royally screwed up this time. I'll miss her endearing addictions. The show was better with her slurring and rambling.